Congratulations to Kynan Home from U12 Gold, who is celebrating his 50th game this week. Best wishes for a great game! Thanks this week to our Club photographers Rene Goffin and Ros Pach, for the wonderful photos of our kids they take each week. They really do a terrific job of capturing the action each Sunday and giving us some lasting memories of the season. Thanks! Some samples of their work below. Drafts of the Communication and Concussion policies are available for parent feedback. 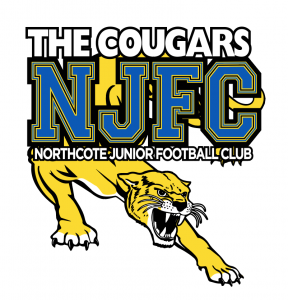 Please forward any comments to president@njfc.com.au – both policies will be tabled for approval at the June Committee meeting. The Carlton Football Club would like to offer the junior football clubs of the Northern Football Netball League the opportunity to register for a FREE 3 game Carlton membership valued at $70. The benefits of the 3 game membership include: > Membership card > General Admission seating for any 3 Carlton home games in Melbourne > Priority access to purchase Finals tickets in Weeks 1 to 3 (if Carlton participate) > Free entry to Northern Blues Ikon Park home games > Member discounts for the Carlton Shop > Exclusive Breaking News emails There are only 500 memberships to giveaway: to register for a 3 game Carlton membership. Most of you would be familiar with the volunteers who have key roles with your team – Team Manager, Coach and Assistant Coach. In an attempt to gratefully acknowledge the contribution our many other volunteers make to helping the club run smoothly we are introducing a new newsletter item to thank our ‘Volunteer of the week’. The inaugural award goes to Vinnie Beatty. Not only is Vinnie our Grounds Manager and Committee Member, he has also taken on the joint U14 Girls Team Manager role. Here he is making sure our kids don’t have to land on dog poo, sticks or stones while they’re playing. If you’re up and about early on a Sunday and can help him out in this thankless job please let me know. Photo envelopes are being distributed via Team Managers in the lead up to formal team photos in the last week of May. Schedules are currently being negotiated with teams, but most photos are likely to be on Wednesday 30 May and Thursday 31 May. If any of our parent group knows of any employee of the Telstra Group who would be willing to nominate the club for a Telstra grant please contact Tom Hall on tomdhall2016@gmail.com We have lots of options for what we would like to spend money on to benefit the club! Congratulations to Iggy Sim from U14s, who plays his 100th game for the Cougars this weekend. In response to various concerns raised by members we have been investigating the merits of applying to change Leagues. A discussion paper with more information will be presented to members in the next few weeks. This is not a decision that the club takes lightly and we will be calling a Special General Meeting to consult with all our members. More details to follow soon. We have almost distributed the new order of bags and have ordered another lot. If you have not collected one yet please drop by at training – if we have run out again there will be another order arriving soon. We are still waiting on the remaining training tops - sincere apologies for the delay and for the small number of errors/omissions that we have ordered replacements for. If you are dropping your player off by car at the home ground on busy match days please make sure that they are set down in a safe area. We don’t want any accidents crossing roads! If your player suffers from asthma, anaphylaxis or any other serious medical condition it is your responsibility to make sure that your Team Manager and Trainer have a copy of your current action plan, and that appropriate medication is available at each game and training session. We take the safety of our players very seriously and our Trainers are instructed to call an ambulance if they are in any doubt as to the wellbeing of any player in their care. We therefore strongly recommend that all families maintain their own ambulance cover to ensure all costs are covered. Our insurance provides refunds of up to 90% of non-Medicare costs up to a defined limit for all players, officials and volunteers; more details are available at https://afl.jltsport.com.au. If your player is injured during a match or at training please make sure your Trainer, Coach or Team Manager knows so that an incident form can be completed to assist with any claims that may result. The first boxes of our training tops order has arrived and will be distributed via Team Managers. We are expecting the remainder of the order to arrive during the next week. Players who have registered since the order was placed will still receive a training top - it just won’t have their name on the back. Congratulations to George Teague from Under 12 Blue, who is celebrating his 50th game this week.